Oh! So you have a wedding during the fall? Now this is going to be having a truly different character than other weddings, which will be during any other time of year. The main reason being that at this time the spirit is amazingly festive. Everybody appears truly hopeful and gaily abundant. You should go ahead and incorporate a few of these should find a way to get all these styles and include reception too. 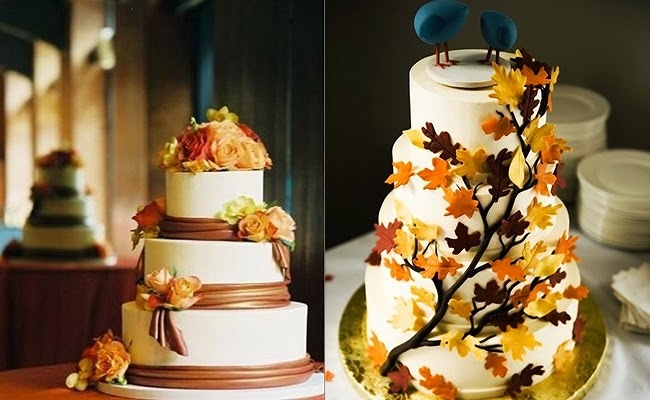 Actually, it is real fun when you begin to add that unique seasonal touch to your autumn wedding; and this you get simply by having a themed fall wedding cakes. You can use Fall flowers like daisies or sunflowers and even chrysanthemums in your bridal bouquets. Go ahead and use items such as fall leaves as centerpieces. If you want the rustic feel, serve the feast in family style. Just keep huge bowls of food covering the tables and ask everyone to help themselves. The easiest thing about planning a wedding in the Fall is that you have the luxury of a huge palette of colors and tastes. Go ahead and look around you for the fall cake decorations. Opt for the Fall foliage, or simply the delicious harvest fruits. Other options can be of using grains or pumpkins and gourds. Just incorporate these into your wedding cake design. Easiest is to go for a cake totally covered in bright marzipan leaves. 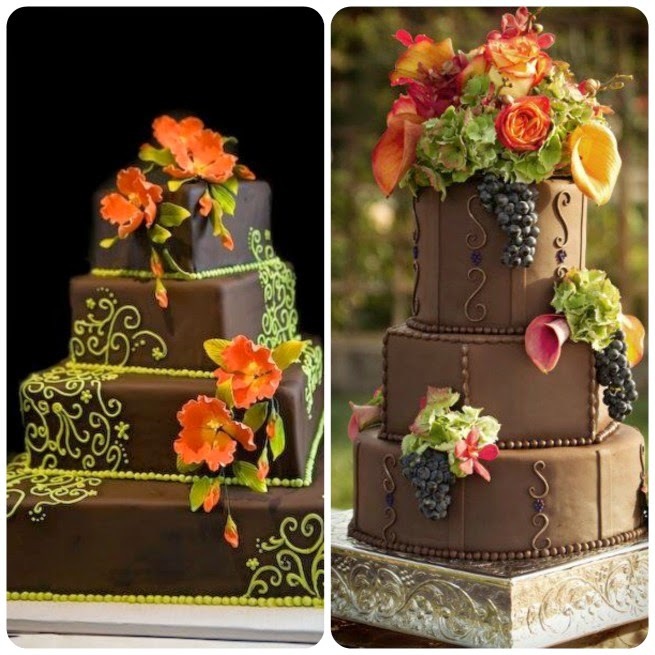 Or, why not decorate your fall wedding cake with tiny pumpkins or miniature red apples. 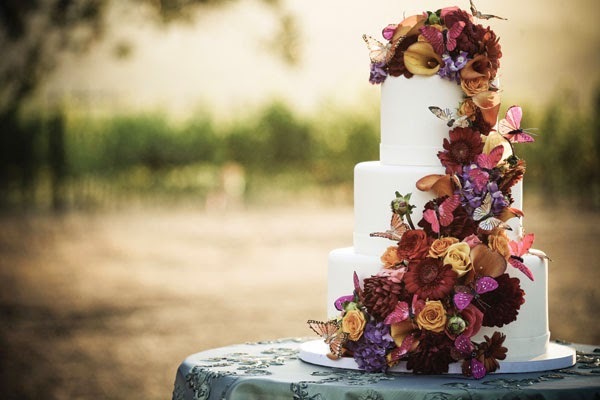 Or would you like to place fresh blooms themselves on your fall wedding cake? Opt for any of the flowers in autumn hues. Go in for sunflowers or orange roses. Another option is marigolds and beautiful zinnias. Either use them directly or they can be placed by using flowers made from gum paste or even fondant for that real yummy look. Not to missed are ample succulent floral berries. Use these and invoke the autumn spirit! Whether you decide on a real rustic or a truly glamorous theme for your fall wedding, the most important thing to consider is the theme. Use this theme in every detail and just let your imagination loose and to let the theme truly shine through! Once you have decided on the Fall Wedding Cake, do remember that not everyone is very comfortable with sugar, maybe because of diabetes or even dieting. So for your health conscious guests go in for delicious little mint dark or even tiny milk chocolate cups. Remember to place them to the side of your wedding cake which has sugar, and put a "Sugar Free" place card in front of them. Give your guests this sweet and healthy option. Another option is the raspberry cups. They are pretty to look at as well as delicious and of course, healthy. They can contain a perfect amount of real raspberries. Traditionally, wedding cake designs have always been tiered white, square or round, with some flavored butter cream frosting. 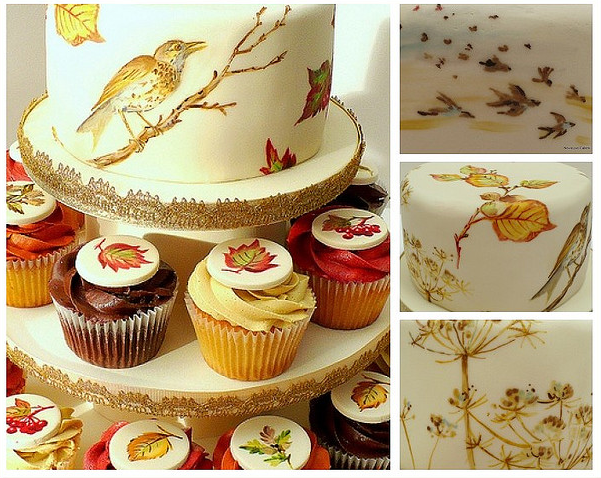 But for your Fall Wedding Cakes, opt for the cake of your dreams. Have it in any combination of shape, style, flavor or color. And choose your own thematic decoration.